ITAD Procedures Improves But Vendors Remain Concerned | HOBI International, Inc.
Large U.S. organizations have made major improvements in their ITAD practices within the last year, according to new primary and secondary research conducted by Compliance Standards LLC (CS). But despite reports of several indications that positive ITAD practices have gained momentum, an unsettled ITAD vendor ecosystem still raises concern among ITAD service buyers, which has led to reduced commitment from users. The rate of ITAD outsourcing jumped from 70 percent in the 2015-2016 research cycle to 87 percent today, highlighting companies’ interest in utilizing best practices and hiring professional service providers. There is also greater oversight of ITAD vendor activity and emphasis on environmental compliance, with a focus on reporting and auditing and recognition of certification bodies. Despite these improvements, CS says several shortcomings are obstacles to sector growth and are causes of risk. 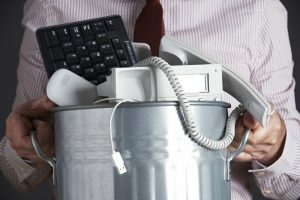 Companies continue to adopt a multi-route to recycling strategy and use their own IT staff to perform parallel recycling tasks, which leads to high risk and greater cost. CS also reports the use of unethical recycling routes, such as disposing of electronics and IT equipment as waste, selling and online trading and storing. Outperforming the market is a group of ITAD companies headed by All Green Recycling, which shows strong figures in BMP, EMP and other rating data. Several companies with the same scale and scope registered similar results, CS says, making them effective competitors but also highlighting the unsettled nature of the ITAD space. ITAD contracts that are defined as “at will” rose from 24 percent in the 2015-16 research cycle to 38 percent, meaning companies are “less committed” and more cautious about whom they deal with. Long-term contracts dropped from 71 to 61 percent. HOBI has been a leader in corporate IT asset management since 1992, and has achieved R2 and ISO14001 certifications at its Batavia, Illinois location and R2 certification at its Dallas and Phoenix facilities. Our disposition services represent best-in-class processes for the IT asset management of equipment ranging from PCs and laptops to complex IT and telecom infrastructure. Our data systems offer complete transparency of the disposition process, from removal to final reporting. HOBI’s IT asset management services include on-site services such as de-installation and removal, data erasure, hard-drive destruction, and logistics management. Our on-site services help to ensure that the IT asset disposition process is safe, secure, and efficient for our clients.